There is absolutely no way I’ll be able to make this relevant to tech. But I’m posting it anyway. 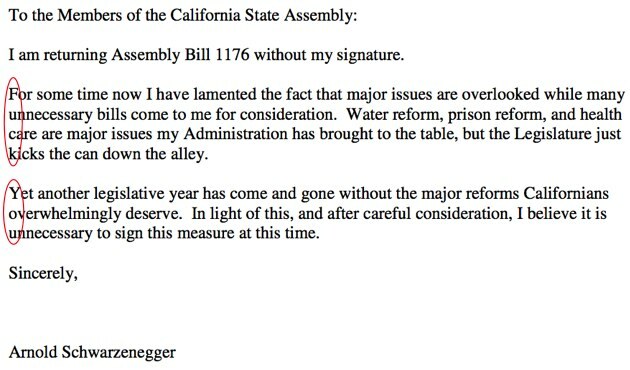 Our Governator, Arnold Schwarzenegger, vetoed a California legislative finance bill – AB 1176. The letter is terse and to the point. And the first letter of each line in paragraphs 2-3 are even terser and more to the point. Schwarzeneggers battles with the state legislature are epic. But this just goes way beyond epic. It’s something for the history books. I wish I had the time to do this kind of thing in my posts here on TechCrunch. See the SF Chronicle for all the quotes and denials.